For the tattoo enthusiasts among you who are too chicken to go under the needle, your next temporary tattoo would not just look rad, but have a functional purpose too. MIT Media Lab, in collaboration with Microsoft Research, has developed a new product called DuoSkin, which can turn temporary tattoos to on-skin interfaces connected to devices. 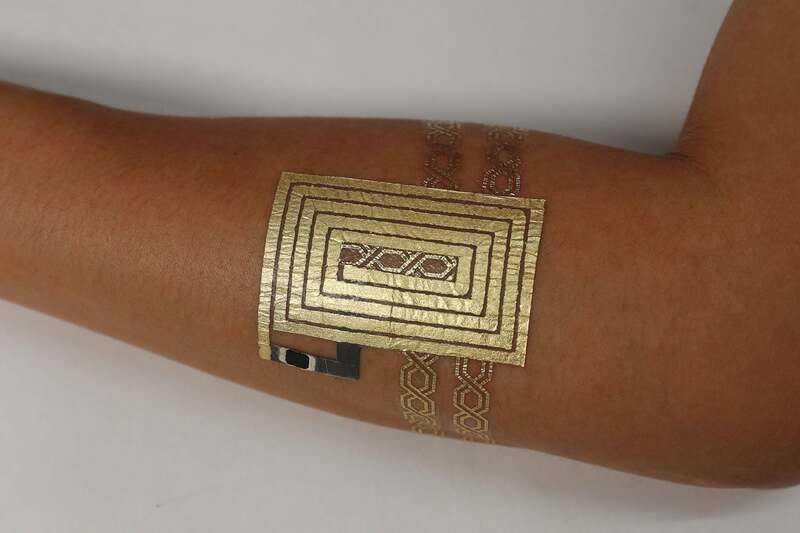 The metallic tattoos are devised to have three functions: acting as an input for devices by turning one’s skin to a trackpad or a button, displaying output that changes color based on skin temperature, and transmitting and storing data that can be read by devices through NFC wireless communication. Using gold leaf, which is traditionally used for paintings, it creates a durable and aesthetic temporary tattoo that is both skin-friendly and affordable. The process begins with sketching the circuit using a graphic design software, followed by the fabrication process using a vinyl cutter machine, adding the gold leaf to act as the conductor, applying the circuitry and finally putting it on the user’s skin, just like any other temporary tattoos. Moreover, each design can also contain an NFC chip, or even LED lights. MIT Media Lab PhD student and lead researcher Cindy Hsin-Liu Kao was inspired from Taiwan’s culture around street fashion for this project, wherein people often change style with accessible and affordable aesthetics. Staying true to its inspiration, the team intends to keep the tech reasonably priced and attractive, with Kao seeing its customization potential for tattoo parlors.